Will Post-9/11 Atmosphere Re-Engulf White House after Pompeo’s Election? Home World Americas Will Post-9/11 Atmosphere Re-Engulf White House after Pompeo’s Election? Mike Pompeo was recently declared as Donald Trump’s pick to lead the US Central Intelligence Agency (CIA). The election has raised serious questions about the future of US policies. Less known to Iran’s media circles, Pompeo is in fact a rightist hawk in the Republican Party. His line of thought is said to show his harsh enmity with Iran, and everything that comes from the country especially the nuclear accord. According to a report by Tabnak, as translated by IFP, Mike Pompeo was one of the unyielding critics of Tehran’s nuclear deal with the P5+1 group of countries and is in fact a figure classified with such figures as John Bolton at the heart of the extremist circle in the GOP. He is not, however, as candid and outspoken as Bolton in raising his outrage against Tehran. As his name was raised as the main candidate to the post of CIA Presidency, Pompeo tweeted on the nuclear deal with Iran and said he was waiting for cancelation of the catastrophic accord with the world’s biggest ‘sponsor of terrorism’. 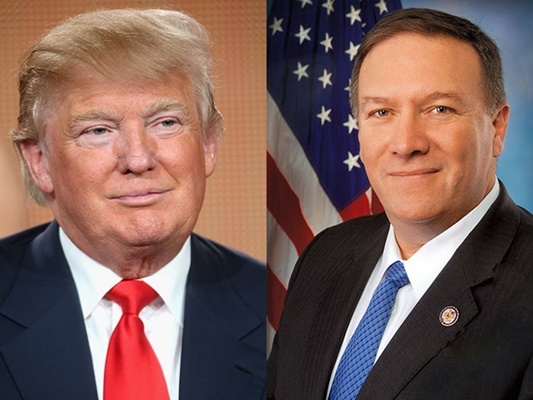 Pompeo had in the US elections supported the Florida Sen. Marco Rubio but as Donald J. Trump was named as the party’s candidate, he started to strongly support Trump and explicitly announced that Hillary Clinton could not be the US President. He and Senator Tom Cotton were those accusing the Obama Administration of presenting certain confidential incentives to Iran in the nuclear accord. Pompeo and Cotton both prepared a report on the issue and sent it to the International Atomic Energy Agency (IAEA) and stressed that in the agreement, the Obama Administration had entered a deal with Iran over certain secret mechanisms in order for inspection of military centers. Pompeo has strong anti-Islamic views and after the Boston Marathon terrorist attacks, he harshly criticized leaders of Islamic groups in the US and asked them to fulfill their duty in connection with taking stance against the attacks or bear accusations of cooperation with terrorists. From the standpoint of many analysts, his election as president of the CIA along with the recent appointments of Donald Trump show that the post-9/11 intellectual system, with extremist hardliners being on the axis in the Republican Party, will start to overwhelm the US political spheres. The loop will probably be completed in the coming days as the US Secretary of State will be assigned.